In Zio’s Kitchen we salute all cultures and today we celebrate our Jewish friends and family by making some a traditional mainstay! We present our interpretation of the classic and fabulous Matzo Ball Soup! 3. When chicken pieces are cooked, add the carrots, celery and cook for about 5-10 minutes or until the vegetables begin to soften. 4. Add 1 cup of water and let come to a simmer. 5. Add 1 cup of chicken stock and let come to a simmer. 6. Add the bay leaves. 7. Add the 3-5 more cups of chicken stock and 3-5 more cups of water, 1 cup at a time (alternating between stock and water). Allow the soup to come to a boil each time before adding. 9. Remove 3-4 cups of stock and put in separate pot, this will be used for the matzo. 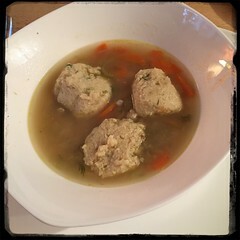 10. place 2-3 matzo balls into bowls and ladle the soup with the meat and veggies on top. Garnish with fresh flat-leaf parsley. 4. Add some fresh flat-leaf parsley. 5. Form 1-1.5 inch calls (keep your hands wet while forming them) and place pot with the chicken stock (without the meat and veggies), let cook for about an hour.